We continue our father of twins interview series with Tim Robinson, father of fraternal twin boys. Joe:	Hi everybody. 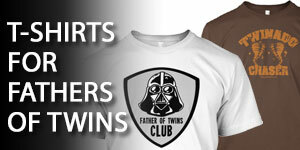 Welcome to the 144th episode of the Dad’s Guide to Twins podcast. This is Joe Rawlinson. As always, you can find me on the web at twindadpocast.com, where you’ll find the complete show notes and transcript for this episode and all previous podcast episodes. 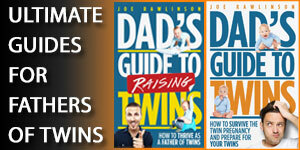 Today’s show is brought to you by my second book for fathers of twins. 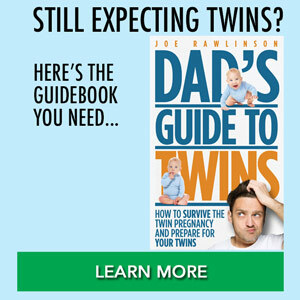 It’s called Dad’s Guide to Raising Twins, How to Thrive as a Father of Twins. 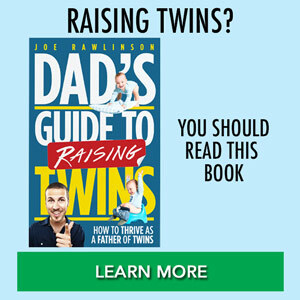 You can learn more about that book at raisingtwinsbook.com. Today, we’re continuing our Father of Twins interview series with fellow father of twins, Tim Robinson. Let’s jump right into his story. Today, on the show, I’d like to welcome Tim Robinson, fellow father of twins. Welcome to show, Tim. Tim:	Thank you. How are you doing? Joe:	I’m wonderful. Now Tim, tell us how old your twins are now and what’s the best part of this stage of your twin journey? Tim:	I have twin boys, Jake and Luke. They are 27 months old. My favorite part about their current stage is they’re doing a lot more talking. It seems like every day they’ve got a new word. They [inaudible 00:01:24] a whole new sentence they’ve picked up on. Just how quickly they learn and how they’re progressing is probably the favorite part of this stage that they’re currently in for me. Joe:	Now, are the boys your only children? Tim:	Yes, that’s correct. Our first pregnancy was the two boys. Joe:	Let’s rewind back to that time when you found out that you were expecting twins. What was that experience like for you? Tim:	It was a shock, of course. I’m sure everybody was shocked when they first hear it. A little bit of just anxious and you feel overwhelmed. But you’re also real happy and overjoyed at the same time. It was a weird feeling. Joe:	Are you boys fraternal, identical twins? Joe:	What was your extended family’s reaction to the twin news? Tim:	My side of family was very surprised. I don’t think I have any relatives that I know of that have had twins. When we told the news to my wife’s side of the family, it seemed like everywhere you turned it was, “Oh, okay, your cousin’s having twins. Your grandmother’s a twin and this …” All the twins started coming out of the woodwork after they found out we were having twins. They weren’t as shocked on my wife’s side of the family. Joe:	Yeah, our twin girls, they were the first in any of our families, my wife’s family or my family. I guess we were the trendsetters in that regard. What were some of your biggest worries or concerns during the pregnancy? Tim:	I think my biggest worry during the pregnancy was just how my wife was faring. She did excellent through the whole thing. She never really complained much. She did an amazing job with the pregnancy. Other than that, there was also the worry of finances, getting everything together that you need for two, when all you’re anticipating was one at the beginning. It really made us question the finances. Everything works out as it should, so it wasn’t anything too bad. Joe:	With the financial concerns, what were some of the adjustments that you made? Tim:	Luckily, we had purchased a home, our second home, before we got pregnant with the twin boys. Luckily, we didn’t go too over budget because the bank was telling us we could go more than we wanted to go. Luckily, we stayed low with our budget. My wife’s very good with budgeting. We just had to cut back on a few things. Other than that, the finances, they fell into line pretty easily once we had a nice budget filled out. Joe:	That’s great. Did your wife or the babies have any health issues during the pregnancy? Tim:	No, everything went really well during the pregnancy. The boys were born at 37 weeks. I think that’s technically full term for … ? Joe:	Yeah, that’s great for twins, exactly. Tim:	She was a trooper. Everything went well. I don’t think there were any issues with the pregnancy. Joe:	Did she have to have a C-section or were they delivered vaginally? Tim:	Well, they were delivered vaginally. My second son, Lucas, he was breech. There was only one doctor in the whole hospital that was still delivering breech. He promised my wife that he would come back. He actually did come back on the second shift when she went into labor. The other doctors were trying to turn Lucas because of him being breech, but they couldn’t. Had Doctor Cohen, if he wasn’t there on site at the hospital, they would have had to do a C-section after the first baby already came out vaginally. She was very fortunate. We were both very fortunate and glad that he was there to deliver the Lucas breech. Joe:	Oh yeah, that’s great. They had just the right person there at just the right time. Does that mean there was a little gap in time between the birth of your two boys? Tim:	They were four minutes apart. Joe:	Did they have to spend extra time in the hospital, or were they able to come home with Mom when she was done? Tim:	We all came home … Two nights we were in the hospital. It was a pretty quick and easy stay there. Joe:	Yeah, that is great. You mentioned that your boys are fraternal. Are they physically very unique? Are they kind of hard to tell apart at that stage? Tim:	He was easy to pick out for us. Joe:	Those physical differences stayed pretty constant as they’ve grown older? Tim:	Yeah, Jake still has a jumbo head. His is a full inch circumference bigger than Lucas. He can fit into my baseball caps. They’re still pretty different. Joe:	That’s great. Our girls are identical. One of them has always been slightly bigger than her sister, like a fuller face and slightly longer when she was a baby, slightly taller now. It’s enough for people that know them to tell them apart, but still people get confused all the time. You brought the babies home from the hospital. Tell us about your work situation, or your wife’s work situation. Who is working, who is home, and how did that play out at your house? Tim:	When we got back, I took two weeks off of work. I was a carpenter in Center City. I did mostly concrete high rise work. I took two weeks off to stay at home with Kerry, my wife, with the boys. My mother, who was living in Florida at the time, took seven weeks. She came up from Florida and lived with us for seven weeks to help out with the boys. She was doing a lot of the assistance with Kerry for the nighttime feedings and changings, while I would sleep in the guestroom or whatnot to get prepared for work the next day after I went back to work. Then my wife took eight months off of work before she went back. Joe:	Also, that’s a good stretch of having somebody home, and then with having relatives stay with you to help you take care of your house and your kids was probably great. Tim:	Yeah, we were very fortunate to have my Mom come up for the first seven weeks. The transition period of going from being a non-parent to a parent was one that was very hard to go to. It was great to have her there for additional support. The extra hands are great. Joe:	Speaking of that transition to being a parent and having twins, what were some of the things that surprised you most or caught you off guard about having twins? Tim:	You’re constantly on. There’s no down time from the minute they wake up to the minute they go back down to sleep. That’s just a constant struggle to … When they’re first newborns, when you have to do everything for them. They’re really not very capable at that point. That was probably the hardest point for me was just all the needs of them. Joe:	Yeah, and as you said, their needs are great, very intense in those early weeks and months with infants. Did you all bottle feed or breast feed your babies? Tim: My wife tried breast feeding for I think about a month or two. Then it was just too difficult, so she went to pumping. We still did the breast milk until they were a year old. Joe:	Yeah, we had some trouble breast feeding as well, so had to change things up. That’s good that you were flexible in adapting to the situation. That’s a common theme for parents of twins is you have to kind of roll with the punches, and sometimes plans change of what you thought was gonna happen. When you brought your boys home, were they in their own room or did they sleep in your room? Tim:	In our room two weeks. The two weeks and then we put them in the nursery at two weeks, just so that it was a little bit of a separation, but still close enough to where you could get to them easily. Joe:	Oh yeah, what were some of the challenge you had with them in your room, those first couple weeks? Tim:	I mean, it was just the typical newborn stage, where it’s three hours of sleep and then they need to be fed and changed. That was a big learning curve as well to try to do. Three hours of sleep, wake up and be ready to go for all their needs. Then try to go back to sleep. Usually, once I’m awake, I’m awake, where it’s after an hour of sleep or nine hours of sleep. That was another adjustment that we had to get used to was trying to sleep when they sleep, and be ready to go when they need you. That was a difficult time. Joe:	Now that your boys are a little over two, you’ve hit a couple milestones along the way that may have made life a little easier for you as a parent. When you think back on these last couple years, what were some of those milestones that they reached that made it a little easier for you as a parent? Tim:	I remember once they could hold their heads up and they could go on those little bouncy chair toys, I remember I thought that was the coolest thing ever that we could just put them in a bouncy chair and they weren’t just laying on the floor anymore. That they were content for a good 10-15 minutes, which felt like two hours at that point. You could just have them be content. That was the good first one. Then once they could start using utensils and feed themselves, even though they’d make a huge mess, that was a great milestone for them to be more independent. You could be multitasking while they’re making a mess and getting some food in their mouth. Walking, that was a big one. That was fun to go from, “My baby can’t get hurt at all,” and then now everything in the house is something that could get kill them. That was a fun transition as well. Every stage has a new positive and negative. That was a hard one to get through because you had to go through and screw everything to the wall and move everything. It’s great because then you didn’t have to bring a stroller everywhere. You didn’t have to carry them everywhere. I think those have been some of my favorite milestones so far. Joe:	Yeah, those are good. It gives them a little more autonomy and you can get a little more space. There’s always a flip side to those like you mentioned. It introduces new challenges you might not have seen before. 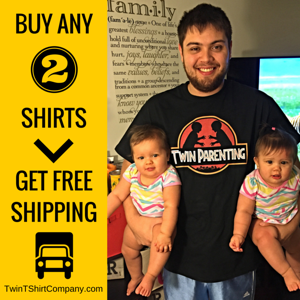 Have you been able to travel with your twins and your family, like on a vacation? Tim:	Yeah. They were born in March. Every year my family, we go to Wildwood, New Jersey for a week or two. We got a house down there. The whole family stays, my mother, father, my two sisters, their husbands. I have two nieces that come down. We went down with the boys in July. They were a little over four months old, I believe, when we went down there. That was probably our first vacation that we went on. That was a very big shock to me. I did not anticipate it. I’ve never been on vacation with kids before. I’ve only ever thought of them as real vacations versus you’re just going somewhere else with kids. It’s no longer a vacation. It was a big learning curve for me when I went down there. We’ve gone a quite a few vacations since then. They get a little bit easier as the boys get older. Joe:	What are some things that you’ve done to make those trips easier for your kids or for your family? Tim:	I have to be in a mindset of you’re still … It’s not a vacation. You have to go there realizing, we have to keep to our schedule. The boys still have to do their nap times. They still have to do food when we have food. If you keep the same routine and the same schedule, it’s gonna make them more comfortable and still feel like it’s the same structured day. It seems to make things flow a lot easier when you just … I mean, every once in a while, you can stay out. If you’re up on the boardwalk, stay out past bedtime a little bit. If you keep stretching it and stretching it, that it’s just gonna make it worse for you in the end. That’s how we’ve noticed it, at least with our boys. Joe:	That’s a great point about maintaining schedule, even when you’re away from home and traveling. That’s something that we try to do as well when we would travel. When it’s just our immediate family traveling, that was easier to do than when we were with extended family, like you’re describing some of these trips. ‘Cause they don’t always understand, “Well, we need to go back to the room to have a nap time.” It’s like feeding time. We had some friction sometimes with extended family ’cause they’re like, “Well, we’re gonna go out all day long and go do something.” We’re like, “Well, we can’t actually do that. We need some nap time here.” It’s all about setting expectations and hoping they’re a little flexible as well. You mentioned schedules. What’s the typical day in a life of your 27 month old boys now? What the schedule like? Tim:	I get up at usually 5:30 to go out … We have 10 chickens and 19 ducks. I go outside and I get them all set for the morning. Let them out of their coops. Then I come inside, and I’ll get breakfast prepped, coffee prepped, and just have a little quiet time to myself. The boys typically wake up anywhere from 6:30 til 7:00 a.m. is usually when they wake up. Then we’ll have breakfast. My wife will go to work usually around 7-7:30, somewhere in that area, she leaves for work. Then the boys and I like to do educational things in the morning. We’ll do books. Different days, we’ll focus on different things. Right now, we’ve got some new books, trying to do alphabet and numbers. Teach them just tracing with crayons and pencils. We’ll do educational things in the morning. Then depending on the day if we have errands, we usually leave 10:00 a.m., something like that, to do errands. Or we’ll have outside time at a playground, something like that. Then we’ll get home. We have lunch is 12 o’clock. Then they have a nap from one til usually 2:30 or three o’clock. That’s when I try to get some chores done, whether it’s in the house or in the woodshop. When they wake up, we’ll have a little snack. Then we’ll go back outside and wait for my wife to get home. She typically gets home around 4-4:30, somewhere in that area. If I’ve got more work, she’ll take the boys while I’ll go back to the woodshop, or start prepping something for dinner. Then the boys usually go down for bed around eight o’clock. We like to try to have them in bed by 8:00 p.m. That is the typical day of 27 month old boys for us around here. Joe:	They’re sleeping straight from 8 to 6:30, 7:00? Tim:	Yes. At two months old, they both slept eight hours. We’ve always been pretty fortunate with their sleep. We did some training with them where we wouldn’t really go in. We read some different books about the sleep training. That’s one of the reasons why we moved them to their own room at two weeks, just to try to keep it more of a separate thing and try to get them on a good schedule. If one of them wakes up, we wake the other one up and keep them on the same schedule as well. Because to have one go down and have the other one awake, it’s just too much in the air to deal with. Joe:	Yeah, we try to keep our kids in sync as well schedules, just like you’re describing to maintain our own sanity. Joe:	It sounds like you’re at home with the boys now during the day. When they were born, you mentioned you were still working, doing some new construction, some carpentry. Tell us a little bit about the transition from basically working outside the home to being home with the boys and sounds like running your own business at home. Tim:	When we first found out we were having twins, we were still looking into daycare. We actually had a really nice daycare lined up. As we progressed through the pregnancy, we were just discussing my hours. It was a pretty far commute for me from my house to work. How many hours I worked. We usually worked Saturdays as well. How much I would have actually been able to help my wife. How much I would have been able to see the boys. The cost of daycare versus the cost of how much money I was actually making at work. It was a dangerous line of work. There was a few injuries, some major things that happened on the site just after the boys were a month old. There was a lot of things that went into deciding. My wife and I had many conversations about the possibility of me staying home and being a full-time parent, just a stay-at-home dad. The main reason was basically how much I would actually have been able to see the boys. It would have possibly been maybe an hour in the evenings and then on Sundays. I didn’t want that to be how much I was in my boys’ life or how much I could help my wife. We had to do a lot more budgeting and a lot more planning and thinking. So far, it’s worked out fairly well that I stay at home with the boys and I have a woodworking company that I run out of a garage on the property. When they take nap times, or when my wife gets home from work, I’m able to go and do some woodworking while still being around my family and a part of their lives, and helps out with some bills and keeps my mind busy so I’m not just going stir crazy at home. It was a real big change for the both of us. It’s a change that I think we’re both very happy with. I think it’s close to two years actually, where I’ve been just at home with the boys. Joe:	I know that’s always a big decision point for parents of twins is … Usually the start of it is that conversation around childcare and the cost of childcare. Then balancing that with schedules like you were describing. Sometimes it makes a lot more sense for one of the parents to stay home. It sounds like you’ve got a good arrangement there. If you could give one piece of advice to your fellow fathers of twins about strengthening their marriage and their relationship with their spouse, all through this journey, the pregnancy and the first couple years of twins, what would you say to your fellow dads? Tim:	I think the biggest thing for strengthening or keeping your marriage strong is to have a set time for your wife or for your significant other. You have to remember that you guys were together first. You have to have No TV Tuesdays, or set up a date night where your grandparents can watch the kids once a month, and still go out and don’t just sit in front of your television screen once they go to bed. I know it’s nice to unwind at the end of the evening looking at your phone or the TV. We like to try set aside time. You almost have to schedule a time for your partner just as much as you have to keep a schedule for your kids because it’s real easy to be exhausted by the end of the day and just want to stare at a screen. We like to do No TV Tuesdays, where we’ll sit out in the sunroom or something like that. It’s just to remember that you have to set time aside for each other. Have conversations that don’t involve just your kids. Still plan dates and go on vacations by yourself if you can, if you have relatives nearby that could watch your kids. I’d say that’s probably my biggest advice. Joe:	That is great advice, absolutely. Making time for your sweethearts because if you don’t make that time, it’s just not gonna happen. You’re gonna get sucked up into other things. All right, Tim, I’ve got a handful of rapid fire questions for you. Just share the first thing that comes to mind with these. 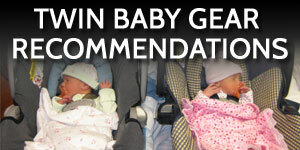 What’s the best piece of advice that you have received about raising twins? Tim:	How you talk to them and how you let them talk to each other. You have to start at a young age, even with the thank yous and the [inaudible 00:25:15]. I don’t like when they just say “Milk,” or “Cheerios.” We’re very strict on “Milk please,” or even when they come up, we have them say, “Excuse me, Mommy,” or “Excuse me, Daddy.” I just feel that if you speak to your children the way you want them to speak to you, that that’s probably been my favorite piece of advice I received about the two boys and how they interact. Because even now, they’ll even go up to each other … not all the time but every once in a while, you’ll see a “Excuse me, brother, can I have that toy please?” That’s probably one of my favorite things about it. It’s just the cutest thing I’ve ever seen when they actually talk like that. 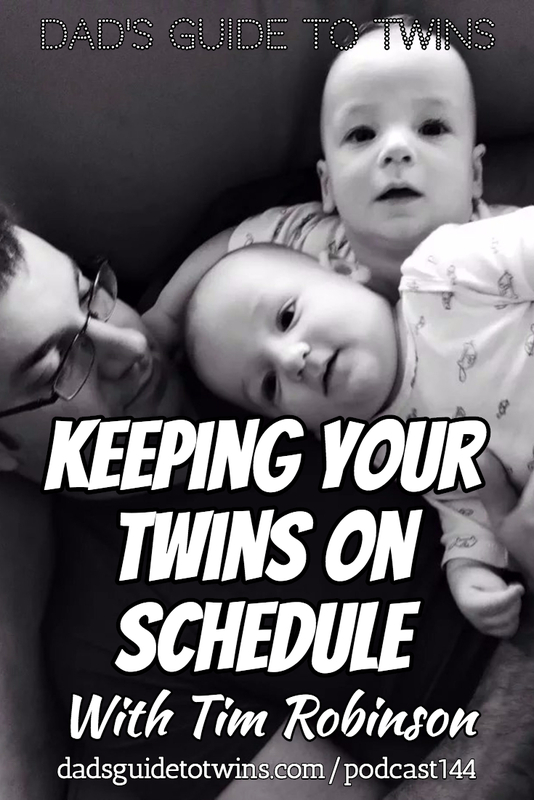 Joe:	What is the most frequent question that people ask you about your twins? Tim:	Well, obviously, “Are they twins?” We get that constantly. The next is, “Are they identical?” That’s probably the most two frequently asked questions about them. The other thing, a lot of people will ask, “Do they act the same?” They’re actually the complete opposite. The two of them couldn’t be more different with personalities. Everybody assumes that they might be the same, but it’s quite opposite. Those are probably the three most asked questions. Joe:	Yeah, it’s interesting how the, “Are they twins?” question. It replaces “Hello.” It replaces “Good morning.” It’s like straight to, “Are they twins?” It’s like the introduction salutation, “Are they twins?” What’s a piece of baby gear or child gear that you and your boys cannot live without? Tim:	We actually have the jogging stroller. Then that the other stroller where they sit behind and in front of each other. The jogging stroller’s nice if you’re going outside or somewhere with wide aisles, but you can’t take that wide stroller anywhere if you have to go to a food store or anything. The narrow one’s nice for the stores when you have to go do some errands like that. They’re at an age now where they basically won’t even go in the stroller unless they’ve walked too much and now they’re tired. We typically just go to stores that have the double stroller carts, like Lowe’s or Target, where they’ve got the two kids seaters. Those are our main twin gear. Joe:	On the flip side, what’s something that you bought before the twins arrived that you never really used? Tim:	I feel we did fairly well with our purchases because we found out at such a early stage in the pregnancy. I believe my wife was eight weeks when we found out that we were having twins. We learned very early on. We didn’t make too many, but a lot our relatives, when they would buy things for the boys, they bought two of everything, two jumpers, two push cars, two swings. A lot of them, we just used one because it wasn’t a constant … It was more of a rotation of, an assembly line with the boys when you’d do the diapers and the food and the swing. A lot of the stuff that we got two of, we left one in a box, and were either able to take back and return, or donate, or give to a friend that was also having a newborn. That was probably something that happened early on with purchases. Joe:	You’re right. The twins tend to take turns more than you would have anticipated. I like your analogy there of the assembly line. That’s kind of how it works. Tim, as we wrap up today, if listeners would like to get ahold of you, what’s the best way to connect? Tim:	The website, twinorchardswoodworking.com. I’m also on Facebook with Twin Orchards Woodworking. Instagram has the same domain or user name Twin Orchards Woodworking. I have that [email protected] is the easiest way to reach me. On the website, I have a lot of images of projects I’ve done in the past. Instagram, I do more of a day-to-day of what’s going on in the woodshop and what are me and the boys doing with the chickens and the ducks. It’s a fun little see the day in the life of the Robinsons on the Instagram. Joe:	Awesome. I’ll link up to those in the show notes for the podcast so everyone can check those out. Yeah, some of the woodwork you’ve done is just amazing and beautiful. I recommend that everybody check those out. Tim, thank you so much for sharing your story with us today. I really appreciate it. Tim:	Yeah, thank you for having me. It was great. Joe:	I hope you enjoyed that chat with Tim about his journey so far as the father of twins. Even that transition from working full time to being a full time stay-at-home dad and getting his business going on the side. Again, I’ll link to his website and all of his contact information along with the transcript for this podcast at twindadpodcast.com. 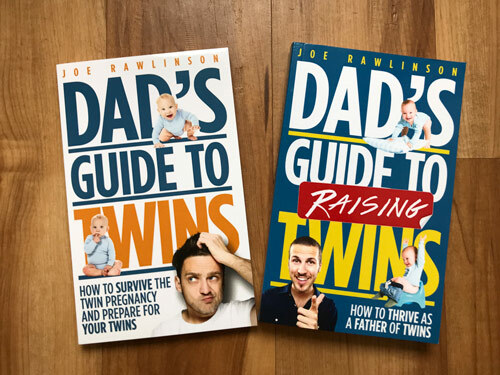 As I mentioned earlier, today’s show is brought to you by my book, Dad’s Guide to Raising Twins, How to Thrive as the Father of Twins. It helps guide you through the newborn phase, infant’s first year, toddlers and beyond. You can check it out at raisingtwinsbook.com. Thank you so much for listening. I’ll see you next time.